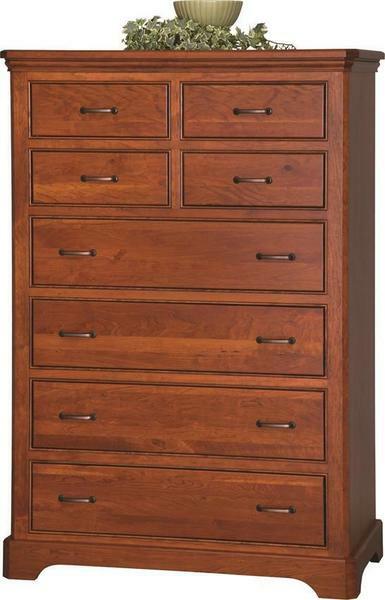 A wonderful storage piece to complement your Four Poster Bed, our Johnson Chest of Drawers offers a quaint style that will bring the timeless elegance of Amish hardwood furniture into your bedroom suite. Starting from the first cut into the sold North American hardwood, down to the last screw in the finished hardware, this chest offers a glimpse into the world of flawless, heirloom quality furniture that makes handcrafted Amish furniture so sought after. From the top to the bottom, this chest features ample storage to serve as an extension of your wardrobe, while providing an large, flat top that is perfect for decor items or everyday essentials. Each drawer on this piece is mounted to full-extension slides, opening fully, to reveal a high-quality, dovetailed drawer box that is sure to offer generations of continued service and enjoyment. The flat panel of each drawer-front and side serves to remind us of how unique and beautiful each piece of wood is, that goes into this chest. The premium stain serves to accent this grain and offers a layer of protection against everyday life. Customize your new chest of drawers with an array of hardwood and finish options, along with special hardware, to make this piece perfect for any style decor. Our furniture specialists are available to walk you through your order process, from requesting stain samples to placing your order online, and can even offer custom quotes for special requests if the dimensions don't seem perfect for your space, or you had something different in mind. Call toll-free (866) 272-6773.